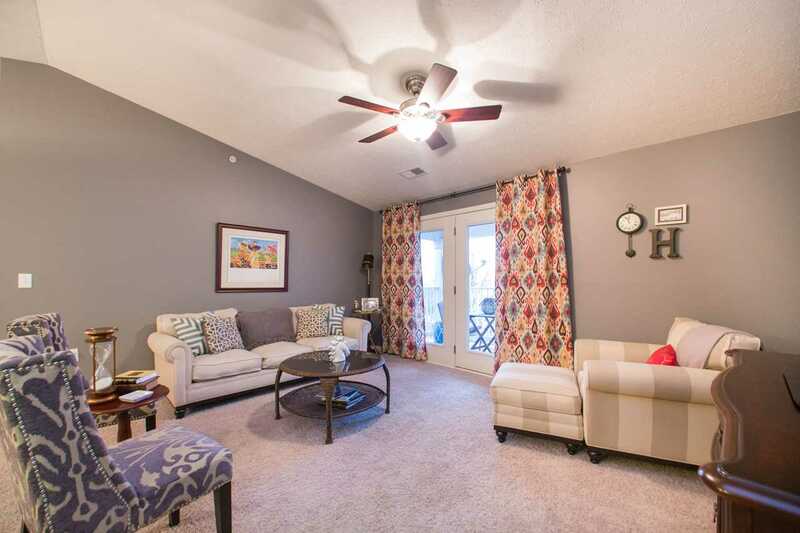 This two bedroom, two bathroom condo with balcony is perfect! Great updates and an awesome location!Featuring 1379 square feet of living space, this condo has vaulted ceilings, stainless steel appliances, hardwood floors in the entry and kitchen, tile backsplash in the kitchen, and ceiling fans throughout! The laundry room off the kitchen has convenient storage cabinets. Both baths have updated colors and beautiful floor tile. An additional den area makes for lots of room to spread out. You will love the views of the green space and the pool while sitting on the balcony. Included is a one car garage! The monthly HOA fee includes water, sewer, and trash as well as groundskeeping and snow removal. Also, enjoy the community's fitness room and pool. Directions:Blankenbaker Pkwy to Rehl Rd. to Bradford Commons to Street. SchoolsClick map icons below to view information for schools near 2602 Aristocrat Pl #303 Louisville, KY 40299. MLS # 1524339: This property at 2602 Aristocrat Pl #303, Louisville, KY 40299 is located in the Bradford Commons subdivision and is listed for $154,900. MLS # 1524339 has been on the market for 74 days.